1. Heat oil in a large pan. 2. Saute onions for 10 minutes before adding garlic cloves. 3. Saute for one more minute. 4. Add chopped tomatoes, water, basil, salt and pepper. 5. Cover with a lid and bring to a boil. 6. Reduce heat to low and simmer for half an hour. 7. Remove from heat and puree the mixture until smooth. 8. Serve hot garnished with basil leaves. 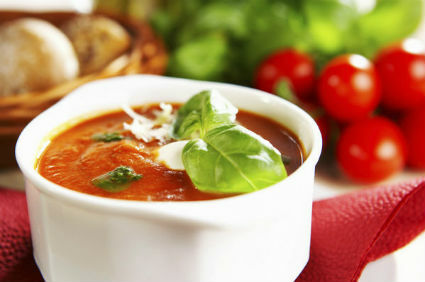 Feel free to comment or share your thoughts on this Tomato Soup with Garlic and Basil Recipe from Awesome Cuisine.